You are here: Home / Insurance / 8 ways How to choose the Best Tem Plan? With so many insurance companies offering term plans, how should you choose a term plan for yourself? 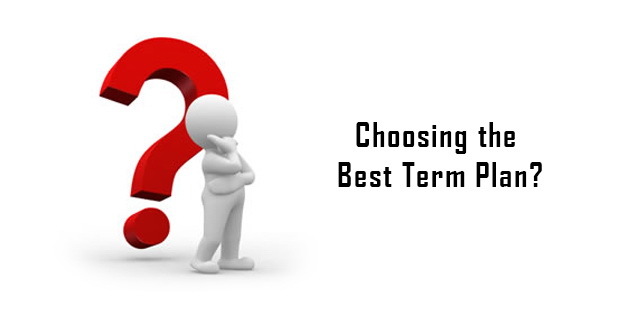 Here are things to consider while choosing the best term plan. When it comes to life insurance, Term Plans are best suited for most due to their high sum assured and low premiums. A lot of individuals can get a significant amount of sum assured by paying much lower and affordable annual premium compared to other traditional insurance plans. However there are so many companies offering term plans with some really good features that make choosing the right one among the others, vital. So how do you choose the best term plan in India? Before you even begin looking out for companies offering the best term plans in India, you should yourself assess the amount of Insurance you need, considering the facts such as inflation and other expenses that may rise in the future, and how would your family cope with those in your absence. Generally it is advisable to go for a sum assured of 12-15 times your annual income. This would pretty much provide for inflation and other factors. However your requirement can vary, but at least have 12 times your annual income as cover. The better the claim settlement ratio the better chances you have of getting your money from the insurance company when you make the claim. There will be companies offering attractive policy terms and features, but always check their claim settlement ratio. Since when the need arises, those fancy features won’t matter, all that matters is the money promised to you as sum assured. Go for a company with claim settlement ratio as high as close to 90% at least. Though this is not the most important point, but it is significant none the less. Some companies have the option to step-up your sum assured over the years depending on situation in your life, like marriage, child birth etc. It is a good option to have if you feel your needs will increase in the future and the current sum-assured will be less. However, this feature is not a deal breaker, since in case your policy doesn’t have this feature; you can still opt for an add-on term plan for the extra sum assured. Step-down in sum assured is needed when you have a windfall or your income rises beyond what you had estimated and are able to make sufficient financial arrangements for your loved ones even without depending on insurance. In such cases you can exercise the option of stepping down the sum assured. If you are a smoker, consume alcohol etc, be frank, and inform this while taking your policy. Your premium may rise slightly, but that will not pinch you so much, as when the claim will be rejected just because you failed to disclose these facts. Also if you have any medical condition, mention that before taking the policy. Also always, insist on a medical test be carried out at the insurance company’s designated medical centres, so that any medical condition is automatically disclosed to the insurance company and they do not have anything against paying your nominee the sum assured if and when the claim arises. Also Read: Why Mediclaim is important and why you Must have a Mediclaim? Just like the claim settlement ratio, it is also important to go for a company with sound financial condition simply because when claims are made, they should be in a position to payout promptly and last the tenure of your insurance policy. If the company is not financially sound, they may face problems surviving for a long term and your policies may be in trouble due to their financial imbalance. Never go for a term plan just because their premiums are lower. A few thousands extra in a year will not harm you so much, as will a bad claim settlement ratio at the time of making the claim. Always keep the other points in mind and never buy insurance by merely comparing the premiums. Go through the company’s terms and conditions, especially the scenarios when your claim will be rejected and see if all those match your requirements. Some companies have certain specific exceptions while some cover for those. By and large the common exceptions or exclusion are pretty much the same across all insurance providers, but there are minor changes here and there and before you choose a term plan, it is better to go through those. You do not need a term plan covering you beyond earning years and hence it is vital to check the minimum and maximum tenure of the policy. If you are 30 you may need a term plan for the next 30-35 years and not beyond that. Also you do not want the term plan to end just a few years before your retirement, since if you were to renew it at that point, the premiums will be higher. So assuming you are 25 while taking the policy, you will need at least another 35 years of coverage and not 30. So choose a plan accordingly. By keeping in mind the above points, you will be able to choose the right kind and best term plan in India for yourself and your loved ones. If you have dependants then it is best advised to get a term plan without further delay.